Art Asylum has revealed some of the Diamond Select Toys Minimates and Femme Fatale figures that will be available as exclusives for San Diego Comic-Con 2011. Included are a Marvel vs Capcom Minimates Boxset, an Alice: Madness Returns Minimate and a Femme Fatale Alice PVC Statue. “Diamond Select Toys is proud to announce the exclusive products they will be offering for sale at this year’s Comic-Con International in San Diego, July 21-24, 2011. With an emphasis on DST’s popular Minimates brand of mini-figures and Femme Fatales line of statues, there will be plenty of products to appeal to fans of comic books, video games, fairy tales, beautiful women, pirates and toys in general. All will be available for purchase at the Diamond Select Toys booth, as well as at other select booths on the show floor. 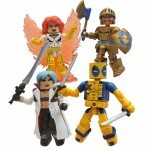 – Marvel vs. Capcom Minimates Box Set – From the arenas of “Marvel vs. Capcom 3″ come four of the game’s greatest heroes, as an exclusive four-pack of Minimates! Clad in their “Player 2″ colors, Dante, Phoenix, Arthur and Deadpool each stand 2.5 inches tall with 14 points of articulation, sculpted by Diamond Select Toys and Art Asylum. – Alice: Madness Returns Minimate – The first toy from the long-awaited sequel to “American McGee’s Alice” makes its debut at SDCC! 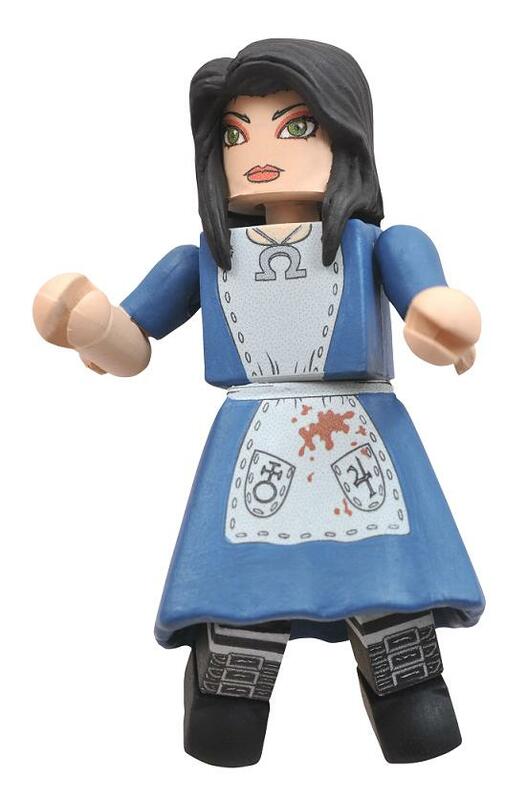 This 2.5-inch, highly poseable mini-figure is based on Alice’s look from “Alice: Madness Returns,” and is the only Alice Minimate that will be produced! Sculpted by Diamond Select Toys and Art Asylum. – Femme Fatales Alice PVC Statue – This new, darker repaint of the Femme Fatales 9-inch Alice statue offers another interpretation of how young Alice might have looked a decade or so after that first tumble down the rabbit hole. Sculpted by Sam Greenwell and limited to 100 pieces. In addition to the box set, figure and statue, there will be four different individually bagged Minimates MAX figures given away throughout the show, while supplies last, as well as four Pirate Raiders Minimates that you can collect to create your own box set at the end of the weekend. A variety of Minimates and Femme Fatales posters will also be given away each day, and there will be a limited number of Minimate T-shirts available for sale at the Diamond Select Toys booth. See photos of each by clicking the headline of the story.